In the past decade, procurement and finance executives have become generally aware of the potential impact of supplier insolvencies, supply disruptions, commodity pricing volatility and the impact that these—not to mention a range of other dangers lurking within their supply chain can have on their business. 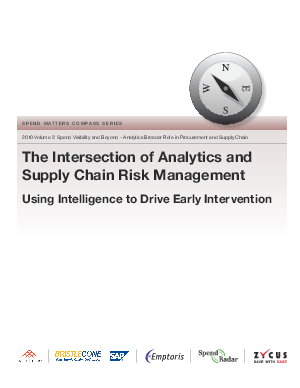 Yet few organizations have begun to make a dedicated effort to target supply risk at the executive level in a concentrated way by building comprehensive supply risk intelligence into their supplier management and supply chain planning efforts. This free report explores hoe supply risk analytics are helping companies to leverage new types of financial guarantees and insurance for their supply chains.